I started off Saturday waking up early, followed by a phone call about ten minutes later from Lorraine. A very plaintive, sleepy voice was asking me, "chai"??? Having brought some of my wonderful chai from Strange Brew and some soy milk, I was fully prepared to be everyone's personal chai monkey for the weekend! I had a handy dandy frother, so I steamed up a couple mugs of chai and ran it up to Lorraine's room! We had some hang out time, then she had to WORK. While she worked wrangling Neil's amazing LONG autograph line, we met up with Daisy and ran around the house! Once Lorraine had some down time, we were able to kidnap her and get her in some skates! Lorraine, being INCREDIBLY clever, decided to get the whole falling thing over with right away. Smart woman. Skating was brief, as Lorraine had to work. After skating and a bit of rushing around and car juggling, we swiped her boss and went out for a quick dinner, then Lorraine and Neil were off for the costume contest! It was AMAZING. I would not have wanted to be the judge. The costumes were so incredible, and detailed, and some of them were very, very clever. Statue of Liberty on stilts! So glad she won a ride on the carousel, she totally deserved it! I didn't get any good costume contest pics, but there are lots and lots of them out there! 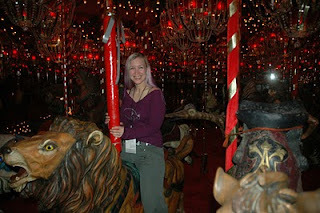 We ended up back in the carousel room with a huge crowd of people, screaming and cheering for those that got to ride! Everyone looked so happy! The girl who did the Statue of Liberty costume was jumping up and down and dancing, I just wanted to hug her! She was the cutest thing in the world!!! Neil was getting ready for his ride, and Lorraine slid up to me and said, "Hand someone your stuff". I looked at her, looked at my friends, and just started saying, "No, no. I can't go if you guys can't go". After a couple thwaps on my head, some light shoves, and the removal of my hat and purse, Dill, Kerrie, and Jane, shoved me over towards Lorraine. Next thing I knew I was ON THE CAROUSEL!!!!! It was surreal, and magic, and the best thing in the entire world! Once you spot Neil in this video, it's Lorraine, then me with the blond and purple hair and the biggest grin ever! After the ride Neil was trying to walk around the house. That. Was. Madness. We were in our little group, and then we'd turn around and there would be 50 people behind us! For the most part everyone was really, really cool. 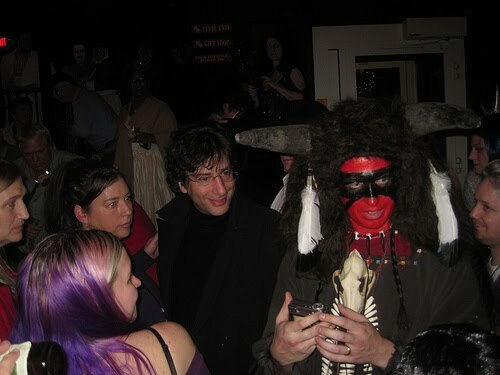 And of COURSE Neil is just the best person to his fans ever! We would get him to a spot where he wouldn't be blocking everything and every one, and he would take 15 or 30 minutes to take pictures with people. Then we would move on, get another huge line behind us and do it all over again. Watching him, he really takes the time to connect with everyone, and everyone who met him was just so happy and excited and beautiful. We got to see so much more of the house, and get a bit of a guided tour from Neil. Kerrie wanted to go see the top of the whale and squid, so we did that as well. I found this crowd shot on the American Gods Flicker page and I'm AWFUL because I forgot to mark down who it belongs to! Sorry random awesome person who took great pictures! Myself and Lorraine in hats. Because, um, yea. Hats! 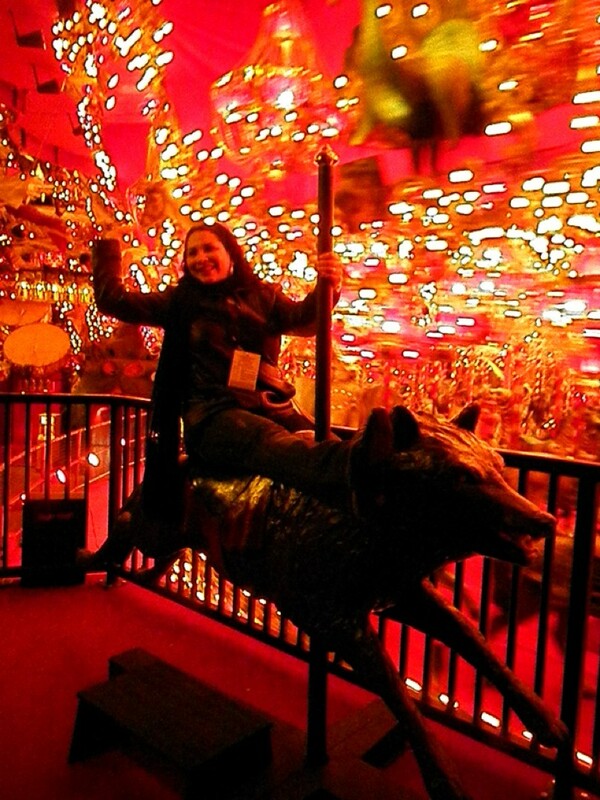 A pic of me getting ready to ride the carousel! Alright. Another post for Sunday's adventures! It will be roller derby and crunch cone heavy!!! I just read your blog AND Lorraine's. Patrick Rothfuss was there, too?! I'm reading his book "The Name of the Wind" right now, and it's really good. I highly recommend! It really was the best weekend ever. I was hoping to be able to introduce myself to you, but as it happens, there were folks from my own town that I never ended up seeing! Neil joined our little group towards the end of the night while we were enjoying magic tricks; it was just such a special moment and so cool that he hung out for a few moments. Seriously Maura? I was right there with everyone for the magic tricks! I must have stood right by you!!!! Argh!